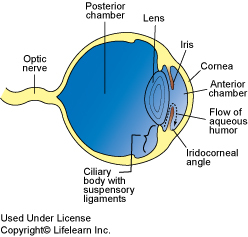 The lens is the transparent structure within the eye that focuses light on the retina, the area where vision occurs. It is a flattened sphere held in place by tiny ligaments around its circumference. There are two main conditions affecting the lens: cataract formation and lens luxation. 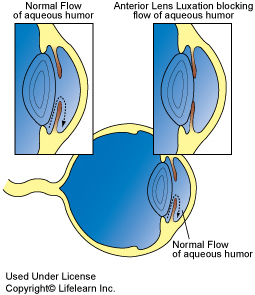 Cataract formation is discussed in a separate handout. "...the lens weaken or break causing the lens to dislocate..."
In some dogs, particularly the terrier breeds, the support ligaments of the lens weaken or break causing the lens to dislocate from its normal position. It can fall backwards into the eye known as a posterior luxation, where it rarely causes discomfort, or it can fall forwards into the eye, called an anterior luxation, where it blocks the drainage of fluid from the eye resulting in glaucoma or increased intra-ocular pressure (IOP). This is extremely painful and can cause permanent blindness. Weakness of the lens ligaments is known to be hereditary in the terrier breeds, Chinese Shar Pei and Border collie. If you have one of these breeds of dog, t is important to watch for any signs of discomfort or change in appearance of the eye and call your veterinarian immediately if you see any changes. What is the treatment for an anterior lens luxation? Surgical removal of an anteriorly displaced lens is the only effective treatment. This surgery is usually performed by a board-certified veterinary ophthalmologist. What does surgery for anterior lens luxation involve? Once the eye has been prepared for surgery, the dislocated lens is removed through a tiny incision in the eye. The incision is closed with absorbable sutures that do not need to be removed. Additional sutures may be placed in the corner of the eye (the canthus) depending on your pet's condition. What post-operative care is required? Your dog may be hospitalized for a few days after surgery for careful monitoring, treatment and rest. Once home, it is vital that your pet is kept as quiet as possible and not allowed to jump or to run up and down stairs. Short leash walks are the only exercise your pet can have for the first few weeks. It is important to follow these directions carefully to ensure proper healing and reduce risk of complication. If you have any problems at all it is important that you call your veterinarian or the referral surgeon without delay. How will my pet's vision be after the surgery? The aim of the surgery is to alleviate pain and restore vision as much as possible. If the lens has been dislocated for any length of time the chance of restoring vision is reduced. With prompt treatment, most cases have reasonably good vision post-operatively. What complications can occur with anterior lens luxations? Complications can occur in some cases. "One of the most common complications of anterior lens luxation is persistent glaucoma." One of the most common complications of anterior lens luxation is persistent glaucoma (increased pressure within the eye). This complication can be difficult to successfully treat. Another potential complication is retinal detachment. This is a condition where the retina is separated or "pulled off" the back of the eye. These pets often remain blind but they are usually pain free following surgery. What is a partial lens luxation and is there a recommended treatment for this? Before the lens completely falls out of position, it can "wobble" as some of the ligaments begin to break. This is known as sub-luxation of the lens. Some veterinary ophthalmologists like to operate before the lens completely dislocates to help avoid the potentially serious complications associated with complete luxation. Your veterinarian will discuss the best approach to your pet's condition based on examination and consultation with an ophthalmologist. What treatment is recommended for posterior lens luxation? "If the lens luxates posteriorly, or falls into the back of the eye, it causes little or no discomfort." If the lens luxates posteriorly, or falls into the back of the eye, it causes little or no discomfort. These cases may not require any treatment. The surgery to repair posterior luxation is technically very demanding and the risk of complication greater. If your dog has a posterior luxation you will be asked to monitor it carefully and seek veterinary attention if there are any signs of discomfort or a change of appearance in the eye. This may indicate that the lens has fallen forward resulting in an anterior luxation. If this occurs, surgery will be required. If you have any other questions, please do not hesitate to contact your veterinarian.